A couple of weeks ago I received an invite from Zomato to attend Ottawa's first Zomato Meetup at EVOO Greek Kitchen (438 Preston Street, Ottawa). 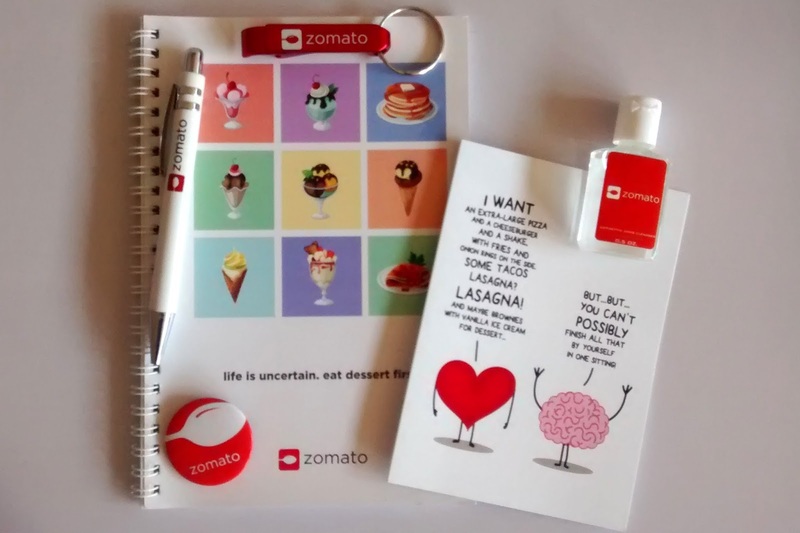 After purchasing Urbanspoon in January 2015, and after many months of Zomato's tech team amalgamating and sifting through reams of data, finally turning out the lights on Urbanspoon on June 1st, I was intrigued about learning more about Zomato and what their meet ups entailed. I arrived at 6:25 after a tour of Ottawa's Little Italy, Preston Street to find one other local food blogger already there. While waiting for others to arrive water and red and white wines were offered. Our waiter, Michael, stopped by periodically to refill our drinks even with asking. There were some times throughout our meal I could have sworn I emptied my glass only to look back two seconds later to find it full again. The Zomato Community Managers Samantha (Ottawa Community Manager) and Kevin (Canada East Lead Community Manager) handed out the set menus for the evening. Michael gave our party of ten an explanation of how things are served at EVOO. All the meals were served "family style" with individuals being able to dish out to their own plates. 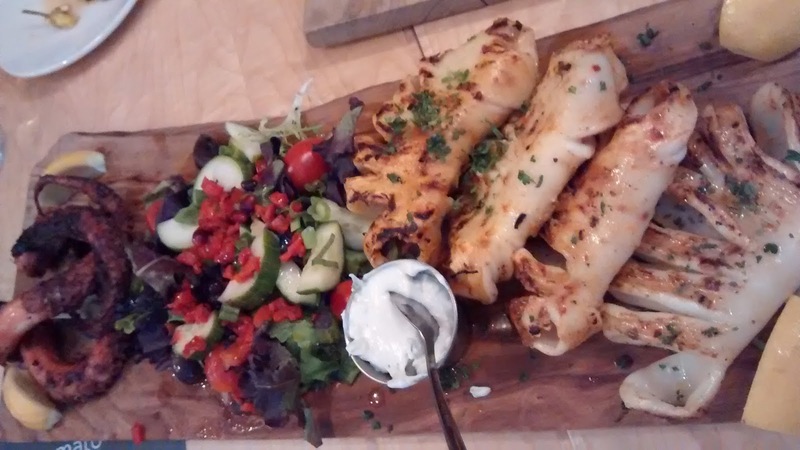 This made serving from the kitchen pretty easy as all they had to do was to artistically arrange the food on large wooden cutting boards and add utensils to serve to the smaller plates provided to each diner. 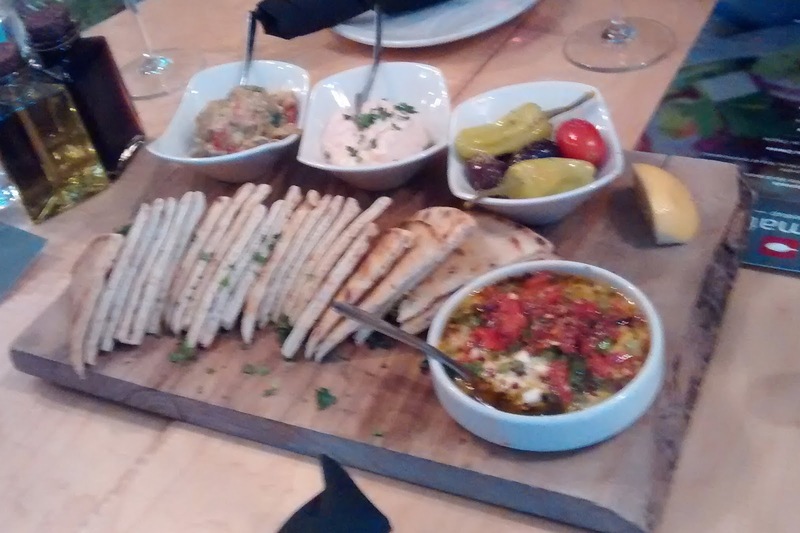 The appetizers were a mixture of Greek dips to be spread on pita bread. The dips were melitzanossalata, spicy feta dip and taramosalata. These all had different textures and tastes ranging from similar to a yogurt to a spicy aftertaste. This was accompanied by a separate dish of Cypriout Halloumi Cheese. This is a fried cheese was quite interesting as it was soft and chewy. Next was the interesting part of the evening. Fried Octopus and Calamari with Greek Salad. Terrific except at our table of four (the other table had six) there was 1 vegan and three who didn't care for seafood. I was willing try one of the offerings and thought the Fried Octopus seemed interesting. But where do we begin? The four of us had no clue as seafood wasn't really our specialty. A few sheepish looks at each other and gazes to the other table finally brought some helpful guidance to avoid the more charred end. The Fried Octopus was a surprisingly tasty dish that I equate to a pork chop. I finished the whole thing and had a second tentacle. For the record, the suction cup like pieces of a traditional octopus after cooking do not stick to your mouth or throat on the way down. Next was the Roast Lamb and the Greek Chicken. The best part of the night! The lamb was perfectly prepared being tender. The chicken was too die for! Great preparation all around. Luckily, out of the four at my table, one person had to leave for a soccer game, another had her own vegetarian dish (which also received rave reviews) and the Zomato representatives switched! 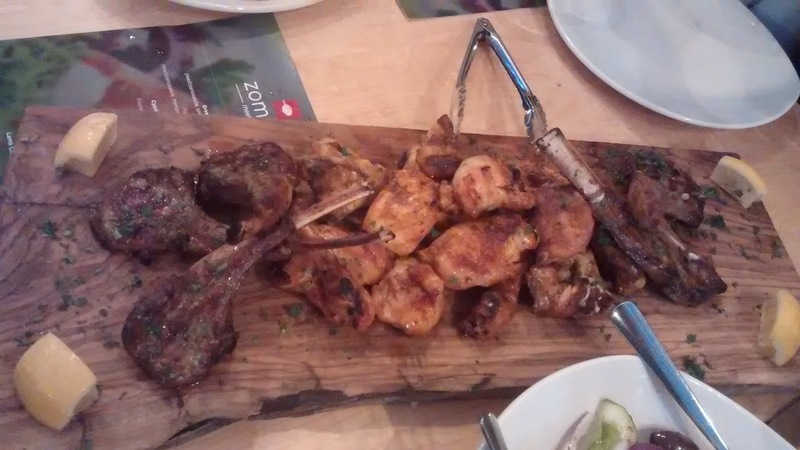 So I got even more of the Lamb and Chicken deliciousness! Overall, the food was excellent and the chef even came out to greet us. 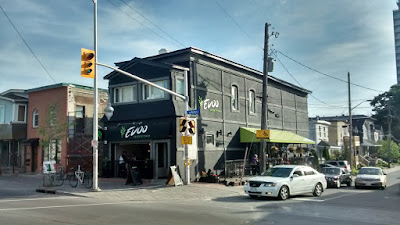 He was originally from Greece and started this restaurant after coming to Canada. He fills an Ottawa need superbly, well made Greek cuisine that simply isn't fast food prepared by mere high school kids. The service, as you would expect was awesome with probably their best waiter and supplementary assistance. This is really the only thing that bothered me. Of course I'm going to get the gold plated treatment when your expecting me and other writers there looking to write about their experience. It kind of removes the intention of writing about the average experience a regular person off the street might encounter. Zomato meetups are interesting and I would gladly do this again as it was fun to meet other local bloggers who not only write about restaurant food but also fashion, recipes, newspaper (local neighborhood newspaper editor) and social media. It was also interesting to put a face to a name on the old Urbanspoon and new Zomato Leaderboards.